As a local business producing or selling food or other culinary products in the U.S., you may already have a dedicated regional following. But targeting a larger national audience, even with a website, presents some challenges. You may already ship your products to a few distant customers. Still, executing the kind of targeted marketing you need to grow a substantial customer base outside your local following requires research and (probably) added cost. But this is part of the pitch of an ambitious startup called Eat USA. To consumers, the company bills itself as marketing products that were “caught, made, grown or produced in the fifty United States.” The idea is to partner with producers and manufacturers of local food and culinary products and make them available to a broader customer base through a single website targeting a very unique market. Developed in 2000 by Arthur Gregory, Eat USA had a rocky start. Headquartered in the World Trade Center, the first kiosk was scheduled to open in September 2001. Terrorist attacks put an end to those plans. The entire inventory had been stored in the nearby A & M Roadhouse and dust from the fall of the buildings contaminated it all. The entire inventory had to be destroyed. The current business model has Eat USA listing products on its website, then forwarding the order to the appropriate company to drop ship to the customer, requiring less storage of inventory. 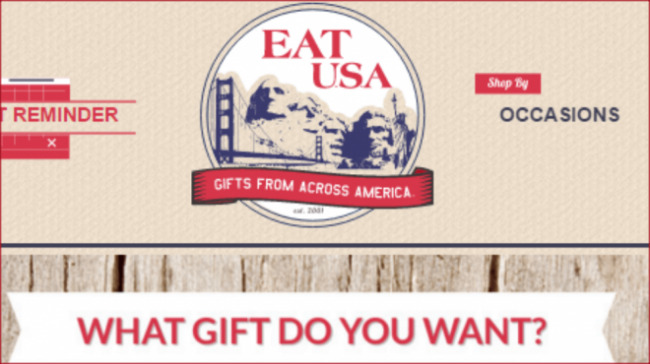 Eat USA has signed up for a Kickstarter campaign to raise money for marketing. Its goal is $20,000. Gregory says, “In the past, we have asked our vendors to allow a three month testing period in order to get a feel for your product and make sure it will work for us. We do this by listing your chosen products on our beautifully designed Web store. The listings will include the product image as well as the product SKU, product name, description, and price. The company plans on eventually expanding into kiosks in malls and airports.